DOES SPIRITISM HAVE SOME VALIDITY? CAN SPIRITISTS TALK TO DEAD PEOPLE? Grupo Elron has only one thing in common with Spiritism (the communication with the spiritual world through mediumship) aside from this issue, there is no other coincidence. 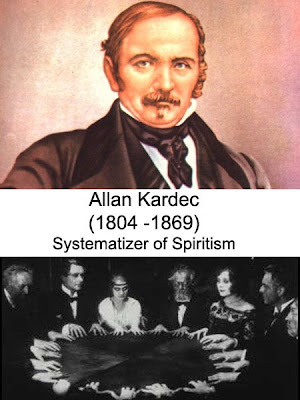 At the present time Spiritism is a dead science that has not advanced since the time Allan Kardec wrote the “Spirits’ Book”, many of the mediums who followed his ideas ignore the reality of the Spiritual World nowadays. In addition, many mediums have preconceptions, which means that they have religious ideas, beliefs and dogmas etched in their minds. Moreover, they have engrams, EGO and even they have their mental decoders damaged, these factors contribute that the messages they receive be completely distorted and therefore without any validity. Obviously during a spirit sessions, they can only contact with spirits of error of the planes 2 and 3. Practically all the mediums who ignore the discoveries of Dianetics, engrams and reactive mind channel messages with only 20% of accuracy or even less. The question is: Are those messages reliable? And the answer is NO, if a message received from an unbalanced medium reaches only 20% of accuracy; it means that the other 80% of the message is false. Obviously that message is useless and has no validity. On the other hand, when a medium contacts with a spirit that says is the father, the mother or a son of a certain person that’s also false, because in the Spiritual world there are no roles, there are no sexes, no races, no colors. There are only spirits 100% or thetans 90%, which means that when they talk about the spirit of a child or the spirit of an old man, they are lying to us. This is the best proof to expose that these mediums are charlatans. When we say that we are talking to Ron Hubbard, it doesn’t mean that we are contacting with a “dead person” ABSOLUTELY NOT. It simply means that we are contacting with the 100% spirit called (RUANEL) whose 10% animated the role in the physical plane of Ron Hubbard. Obviously it’s only a reference, so that Scientologists know that we are talking about that character. WHAT IS GRUPO ELRON DOING? We are not the only ones that contact with entities of Light, as a matter of fact there are other four groups that receive the messages correctly, although we don’t know who they are. Entities of Light can be contacted through a balanced medium, which means that this medium has to be psychologically balanced, he/she must be clear, without engrams, without preconceptions an above all things without EGO. Obviously mediumship is extremely risky, if a medium is unbalanced and he/she has the mental decoder damaged, he/she could even end up in a madhouse. The problem with scientologist is that they don’t believe that this communication be possible, in fact they have not even tried to contact with RUANEL (the spirit that played the role of Ron Hubbard in the physical plane). However this contact has been achieved by Grupo Elron and we are still waiting that scientologists accept our invitation to a session of telepathic contact with Jorge Olguin. Whenever we embody in the physical plane, we do it only with a 10% of our spirit, which means that the other 90% or thetan is still in the respective spiritual plane. The 10 % of the spirit that embodied is like an actor. That spirit can be a teacher, a doctor, a carpenter, mother, father, son, etc; these are only roles among the many roles we have played in several incarnations, but these roles only belong to the physical plane, which means that when we disembody that role is the one that dies. Spiritism, in this sense, it’s only a farce, and even more when spiritists contact with spirits of error that don't hesitate to deceive them pretending to be a Master of Light or a relative that passed away. The case of these famous TV mediums who allegedly say they talk to “dead people” is a farce. They don’t know about the spiritual world, they have preconceptions, EGO, and they are not even clear. As a matter of fact, they are only preys of the spirits of error that make them believe they are “especial”. Each one of them has web pages, they have thousands of followers and they live deceiving people who ignore about the Spiritual World too. There is nothing we can do about it, because each one of us has free will, and the people that follow these false mediums choose to believe their lies. Once again there are no roles, sexes or races in the Spiritual plane, and nobody in the physical plane has powers (there are gifts); so when they say they see the spirit of a child or the spirit of an old lady, it’s because they have their mental decoders damaged by the spirits of error. Appreciated Teresa: Many mothers write to me looking for some answer for the anguish that losing a son or a daughter means. I sincerely hope that what I’m going to tell you, don’t surpass your capacity to understand. I tell you this because the loss of a beloved being is a tremendous shock. The answer that I’d give is always the same: "Know yourself and the truth will set you free"
We are spirits, and we embody in the physical plane to play roles, but they are only roles that belong to the physical plane. When we disincarnate those roles disappear. This is what Jesus meant with these enigmatic words: "If anyone comes to Me and does not hate his father and mother, wife and children, brothers and sisters, yes, and his own life also, he cannot be My disciple” (Luk 14.26), The Master Jesus meant with these words that we do not have to be attached to these roles in the physical plane that are only ephemeral. Obviously there is nothing wrong if one loves a wife, a husband, a son or parent, What Jesus tried to explain is that we don’t have to be attached excessively to those roles, the Master always preached about impersonal Love. Each one of us embody with only a 10% of spirit as if we were a key that is inside a keyhole (part of the key inside of the keyhole and the other outside of it) when you remove that key is once again a 100%. I give you an example for you to understand: When my father died (or rather the spirit that played the role of my father disincarnated) in the year 1978. I truly wanted to contact with him; that is the reason I began to contact telepathically with the spiritual world. I was deceived by many mediums, who said to me lies. Finally, when I could contact with the Masters of Light, I learned that the spirit of my father had played merely a role in the physical plane. My father was a “character” interpreted by a spirit, and that spirit had embodied many times playing many roles as well. The role of my father had died, but the spirit that played the role of my father was immortal, which means that the role of my father doesn’t exist anymore, but the spirit that animated him is still alive in the spiritual plane. So, it’s useless to try to contact with a dead relative because I already tell you that in the Spiritual plane there are no roles, sexes or races. Although, you can contact with the 100% spirit that played the character of your son in the physical plane. This is the reason we don’t use the verb “to die” because death doesn’t exist as an entity. After all I said you will certainly imagine that we can communicate with a “dead person” any I remark the word “dead” because it is not true that somebody dies, but rather one disincarnates. For that reason Spiritism is a falsehood, because we cannot contact with the roles. It is as if you wanted to contact with James Bond (a fictional character of the movies). Well that communication is impossible, perhaps I can contact with the “actor” Sean Connery who also played many other roles as an actor, Do you understand me? Knowing the truth can be somewhat hard, because it means that a dear being that one loved with the whole soul was not as real as we thought, in fact he never existed. To conclude, do not fall into the trap of those false mediums that pretend they can contact you with your son, they will surely contact you only with spirits of error instead. Interlocutor: Is that you, Master Ruanel? Ruanel (with a voice from afterlife): Who has summoned me? Interlocutor: Master, It has been very funny for me to hear your imitation of a session of Spiritism! What is the reason of that joke? Ruanel: Those pseudo spiritists of the last century spoke in that way. In fact nobody was summoned. They simply had a very big suggestion and their feverish imagination made the rest. Although, there were also other meetings that were held at a “round table” and after taking their hands they channeled big entities of error that moved objects making focus and they provoked accidents. Interlocutor: I don’t understand. What kind of accidents? Ruanel: Well in that time electric light didn’t exist and they used candles, and when the spirits of error moved the tables, they used to cast the candles down, the tablecloth used to catch fire and many of them ended up burnt. Interlocutor: I cannot believe it! That sounds funny to me. Now that you approached this topic, what is behind that famous ectoplasm? Ruanel: Directly it’s like egregore, thoughts that transform into energy. Interlocutor: So ectoplasm, is the energy of the materialized thought? Ruanel: Correct, it is not nothing else than that. Before you start with the questions, I comment you that the Master Johnakan Ur-El wrote a note about the astral plane, which is very important, because most of the esoteric people believed that there was an astral plane, a subtle plane, a causal plane, a ludic plane, etc. etc. Interlocutor: Which are the only valid planes then? Ruanel: The only valid planes are the spiritual planes, that is to say, the supra physical planes. An astral plane can be anyone of the spiritual planes. And when the 10% embodied travels astrally, it travels to many the spiritual worlds as well as the physical world from the spiritual world. For that reason you can travel to other worlds, and for that reason you can travel to spiritual planes. Even a 10% can see the spiritual world. What happens is that the 10% depends on his/her mental decoder and he/she won't understand what he/she sees. Do you understand what I mean? Ruanel: Yes, always in the present. Interlocutor: Although the topic was already cleared up in another session, it would be convenient to emphasize that there is no “silver cord” as Lobsang Ramp said. Ruanel: Correct, the 10% is always attached to the body, but not by any cord. Interlocutor: When the 10%, is outside of his/her body, does he/she have bigger connection with 90% or thetan? Interlocutor: And sometimes they join? Ruanel: They can be joined and then one can visualize past lives and that person can believe that is traveling to the past. It is impossible for a 100% spirit or 90% thetan to travel through time, so even in astral trips this is not possible. Time travels are only possible in the physical plane through Quantum physics, emphasizing the word “physics”. When a time traveler goes to the past or future, he drags his thetan to that past of future, there is no other way. Although we have said it many times, the “silver cord” does not exist, it is only a metaphorical idea of the connection between the 90% or thetan and the 10% embodied. This entry was posted at Sunday, November 08, 2009 and is filed under Concepts . You can follow any responses to this entry through the .